It’s her all-time favourite golf course and it showed as Carrie Park overcame a shaky start at George Golf Club to claim the first round lead in the Sunshine Ladies Tour Dimension Data Challenge on Friday. The South Korean took the sting out of a double bogey at the opening hole with a birdie at the second and racked up four further gains to set the early clubhouse lead with a three-under-par 69. The early starter’s score went unmatched as defending champion Nicole Garcia, 2015 champion Stacy Bregman, Nicole Bekker and Swiss golfer Valeria Martinoli all came up a shot shy of her target. “This is my last event before I have to return to Korea because the rest of the schedule conflicts with the Korean LPGA Tour, and I’m just where I want to be,” said Park. The reigning SA Women’s Masters champion was pleased with her comeback after a dreadful start. Garcia got it to three under at the turn, but gave herself a lot of hard graft on the back nine with a double bogey at 10. “I had a three-putt at the third for bogey, but I managed to cancel it and then we had quite a long wait at the turn,” said Garcia. “I just lost focus in the 10 minute wait. I got a flier out of the rough and short-sided myself and I didn’t hit a good shot and made a quick double. In-form Bregman won the season-opening Canon Ladies Tshwane Open and leads the Investec Property Fund Order of Merit after a tie for second in the Joburg Ladies Open and a top four finish in Cape Town. She dropped two shots in her outward loop but made up for it with birdies 14 and 16. 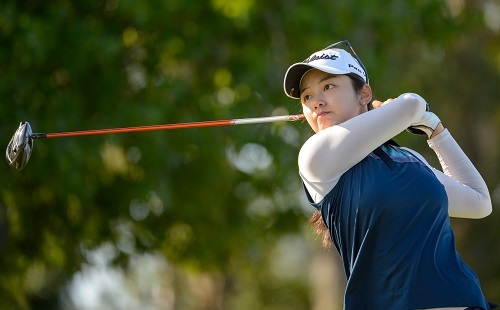 Jamila Jaxaliyeva – the first Kazakhstani to compete on the Sunshine Ladies Tour – moved into sixth place after she cancelled a quartet of bogeys with birdies at four, five, seven and 15. She is one shot clear of a group of eight players that include 2017 Canon Ladies Tshwane Open champion Kiran Matharu from England, former South African Women’s Open winner Tandi McCallum and Ladies European Tour winner Anne-Lise Caudal from France, who lost the Cape Town Ladies Open in a play-off to Lee-Anne Pace last week. Sarah Bouch from Ekurhuleni, Kingswood talent Zane Naude and Lindi Coetzee from Gauteng North lead the amateur chase on two-over 74. The trio share 16th place with Camilla Hedberg from Spain, England’s Lauren Taylor, South Africans Kim Williams and Francesca Cuturi, Norwegian Mariell Bruun and Clara Pietri from Switzerland.